In my dream, schools are not insulated, top-down structures that hide children from the real world and indoctrinate them in standardized information that the teachers themselves can’t even believe in. My dream school promotes divergent inquiry and creativity, not convergent compliance. This school is a democratic institution, embedded meaningfully into its surrounding community. Students build a sense of fellowship and respect through authentic projects that connect them with a larger community. In its best form, my school’s projects are of a service-learning nature. Students are engaged in purposeful, enriching work that compels them to strive for success in everything they do – you don’t do the work for a grade, but because someone is depending on it. The school functions as a launching pad for learning in the outside world. Reciprocally, students are connected to the adult world through visits from mentors and professionals who volunteer their time in the school. Three weeks ago, I presented this dream to my colleague, Maria Brandecker. While Maria and I have varied views of an ideal school, we both agree on the importance of community in two respects: A strong sense of community within our school (teachers and students) and an authentic connection with the real world. We both envision a school that emphasizes how learners can affect the outside world through community service and social action. We identified a weakness in our school’s sense of community that prohibits our dream from taking place. As we see it, a community can be achieved on several levels throughout High Tech Middle – school wide, grade-level and staff. We see gaps in the sense of community on many levels that perhaps contribute to a lack of school pride and respect, along with mounting discipline issues and inequities amongst our staff. We have a notion that our school’s community might feel more purposeful or united if we established a stronger connection with the communities surrounding our school. Furthermore, our sense of community could be fortified if we all felt like we were making a difference to the world outside. In this case, High Tech Middle calls for a stronger dose of adult world connection and perhaps an injection of service learning projects. High Tech High founders (Rosenstock & Riordan) found evidence supporting the benefits of this notion. “High schools should make the adult world of work and learning apparent and accessible to students.” They envisioned a high school that would embed “itself deeply in the community by listening and responding to community needs.” (Riordan, The New Urban High School, p. 3). I realize that if I want to be an agent of change at my school, I’ve got to be in touch with the dreams and practices of my fellow teachers. Secondly, change needs to be sparked by existing momentum. After reading an excerpt from the book, Switch, I was moved to search for existing “bright spots” in my school – places where community building and connecting with the adult-world already thrived. I found three. 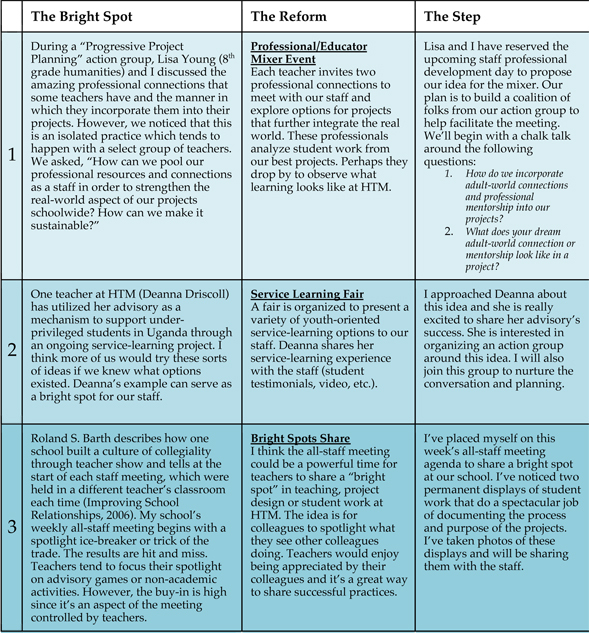 My next step was to find a way to share and amplify these successes at our school. This will be the basis for my proposed reforms and steps. Below is an account of this process in three instances. After my consultancy discussion with several teachers in the GSE, it occurred to me that I might be biting off more than I can chew at once. Taking on too much could result in losing momentum and ultimately failing to make any successful steps. What I need is focus and perhaps quality control. I’ve decided to pursue the Professional/Teacher Mixer event in step one. This option seems to offer the most in terms of building morale and a sense of community and purpose amongst our staff and connecting us with the surrounding community of San Diego. Chris Wakefield, from HTHMA, has expressed an interest in connecting his school with this event. Stacey Callier has even said that the event could go village-wide. While I see the potential for this event to build momentum and grow bigger than I had originally dreamed, I think it will be important to start small and simple. I think I will help motivate Lisa Young (my colleague) to organize this first event at our school. We’ll see how it goes and then consider expanding the idea. For now, Lisa and I will reserve a ½ day Wednesday staff day for presenting the idea to our staff. We’ll solicit their critical input. We’ll listen to their needs, concerns and dreams. We’ll tweak the design, if necessary (remembering to build a sense of shared vision and coalition). Finally, we’ll set a date for the event and let our colleagues begin to assume ownership of the idea and help it evolve into a school wide idea.